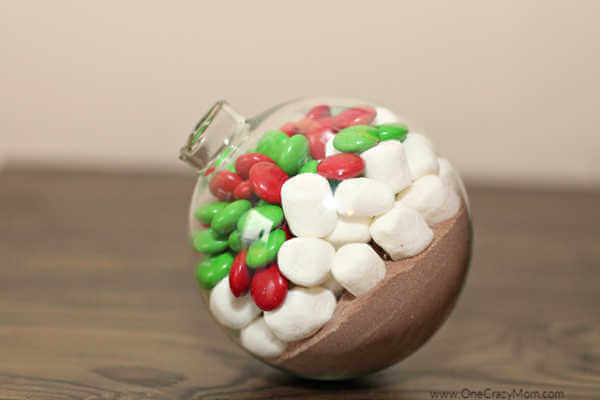 If you are looking for Hot Chocolate Gift Ideas, this Hot Cocoa Ornament is so cute and really easy to make. Individual hot chocolate gifts make such a thoughtful and practical gift sure to be a hit with everyone! Are you like me and have a seemingly growing Christmas list? It can get very expensive shopping for everyone and often you need just a little something to show you care. I started making these festive Individual hot chocolate gifts to hand out to friends and family, coworkers, neighbors and more! They are so adorable and look gorgeous layered in these clear ornaments. 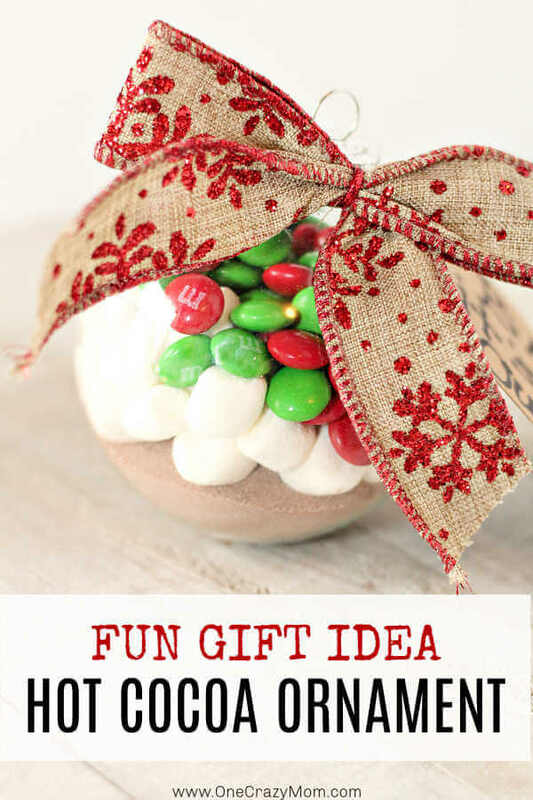 It is such a fun idea and one of my favorite Christmas gifts to make. Homemade gifts are so fun and everyone seems to really enjoy this hot chocolate gift. Top with a bow and you have such a pretty gift and it’s frugal too. Plus, it is so practical because everyone loves hot chocolate! Save even more money by making this Easy Homemade Hot Chocolate Mix. I like to know what exactly is in my hot cocoa mix and it is so simple to make this hot chocolate recipe with dry milk. It also saves me money from purchasing store bought cocoa powder and allows me to make even more gifts on a budget! We typically keep some mix around so it even works for those last minute gifts. It so easy with powdered milk and powdered sugar. Another idea is to make a Hot Chocolate Gift Set DIY! 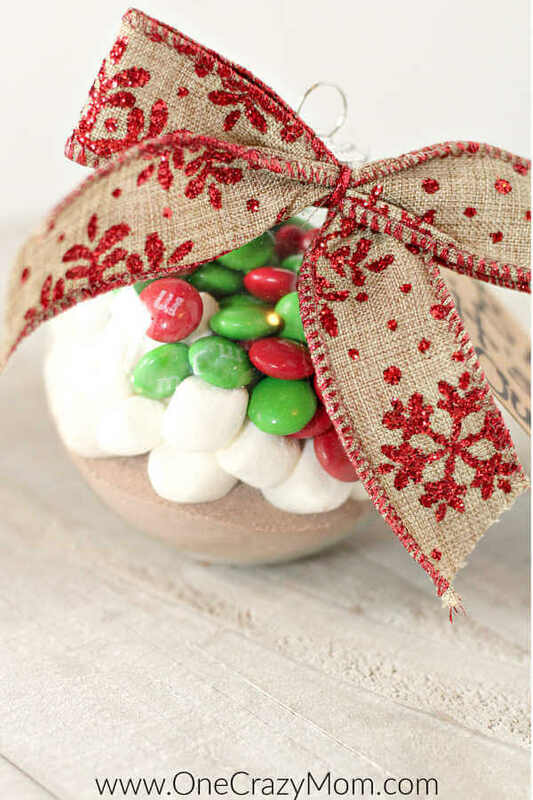 This is totally optional but sometimes I will make a little gift basket with this Hot Cocoa Ornament, a candy cane or two and a couple of cute mugs. I have even tossed in a cozy throw blanket and a movie I snagged on clearance. We love to give practical gifts and things people can really enjoy and use! Let’s get started because you are going to love these holiday gift ideas! I have a feeling it might just become an annual tradition! I’m going to show you how to make Hot Chocolate Gift Ideas DIY! Make a list of everyone you need a little something for because these are going to be so cute! It is truly the perfect gift for anyone on your Christmas list. I have seen these at Christmas bazaars and such and they look so pretty. Now, you can make your own and save a ton of money. Let the kids help and make an afternoon out of it. So fun and what a festive way to spend the time together! Not only will you have lots of great gifts to hand out but you will have precious memories as well. Enjoy! All they need to do is add hot water to enjoy this hot cocoa mix. I also like to add chocolate chips but that is totally optional! You really don’t “need” them since you have the M&M’s but it does add a little something extra. 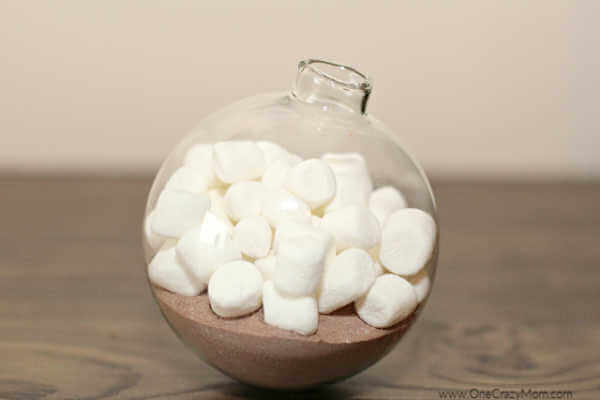 Another option is to make Hot Chocolate Mason jar favors. 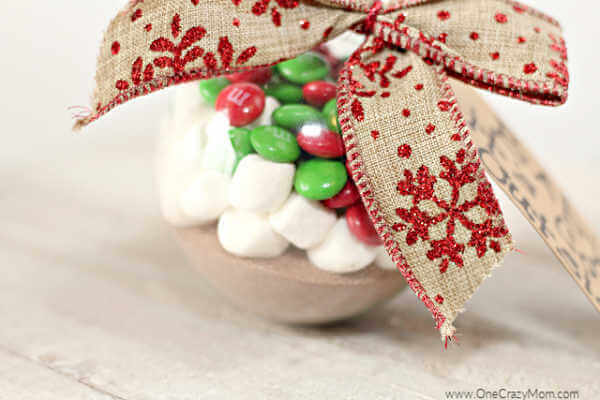 This is a fun option if you would rather use jars instead of the ornaments. Mason jars are really cute. You can get a case of mason jars very reasonably priced on Amazon. 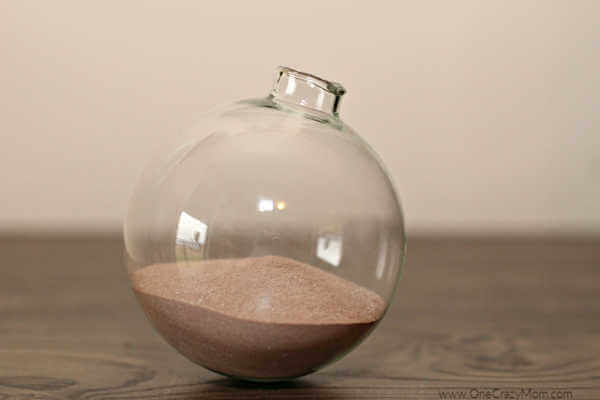 This is a great idea if you would like to use more hot chocolate mix as the jars can hold much more. Whatever you decide to use, I am sure it will be well received and a huge hit. Let us know what you decide to make! We actually make Layered hot chocolate mix in a jar and it is always a hit! Just get the size of jar you prefer and layer just like you would in the ornaments. It is so easy and looks really festive. I use this Easy Homemade Hot Chocolate Mix. You can purchase if you prefer but it is so easy to make your own and tastes so rich and creamy. We love making homemade gifts and everyone seems to love them. These gifts are fun and practical plus budget friendly. 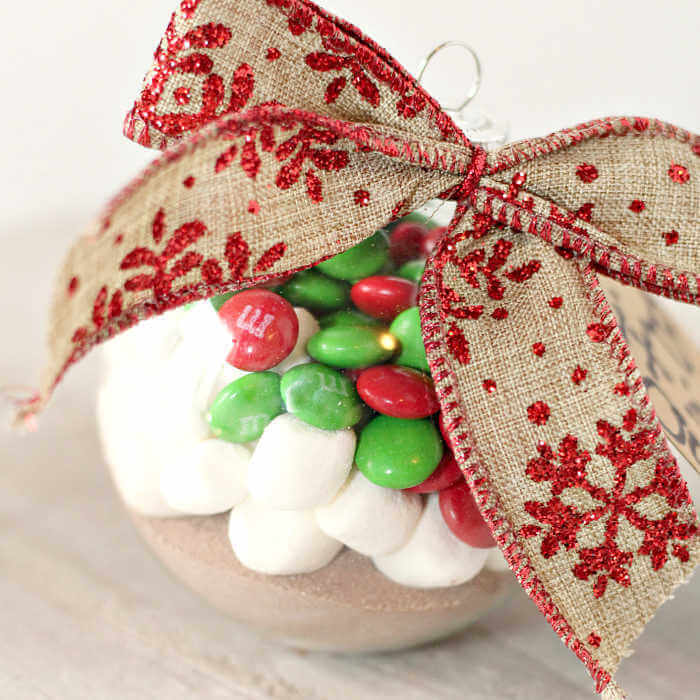 Whether you decide to make hot cocoa ornaments and gift baskets or baked goods, they will be a hit. People will love these gifts and get lots of use out of them. Plus, they are so fun to make! Homemade Christmas gifts are so thoughtful and really special for those people in your life on your Christmas list. 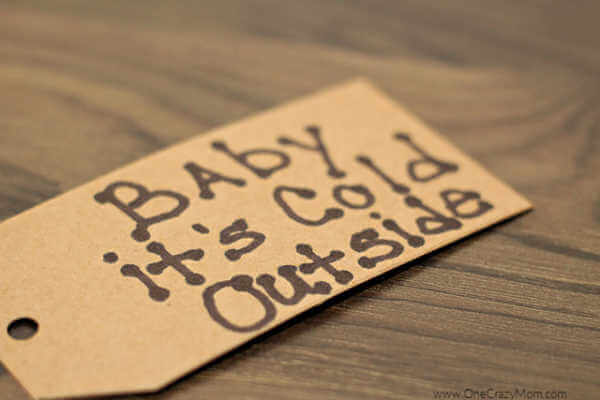 Don’t stress over expensive gifts and your long shopping list. 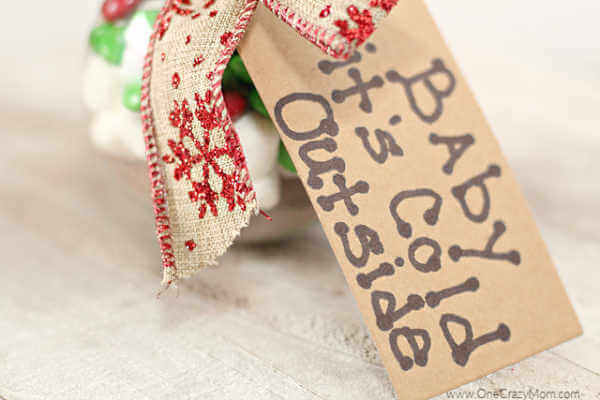 Just make some of these frugal and homemade gifts sure to make everyone feel loved and cared for.